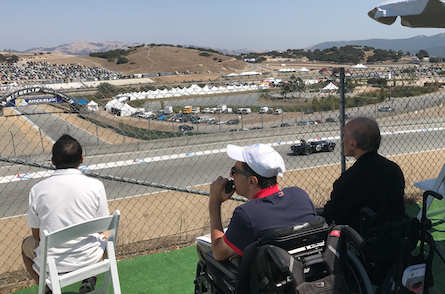 Every year, Brian King of Global Wealth Partners (GWP), hosts a booth located directly adjacent to the Hospitality Center at Laguna Seca Mazda Raceway near Monterey, writes Nick Struthers, NorCal SCI co-founder. Brian's continued generous support allowed me to invite some of my friends from the SCI Community to enjoy the fantastic day in real style. With one of the best viewing locations on the race track, this vantage point had the best view of the famous Andretti Hairpin with the fastest part of the track leading into it. You could also see more than half the race track snaking over the undulating landscape. For those not familiar with the event, Gill Campbell, CEO of Mazda Raceway Laguna Seca, writes "Racing history comes alive both in the paddock and on the race track ... these magnificent machines have been lovingly restored and presented in the most authentic condition thanks to the owners and mechanics that bring the show to us." There were over 500 fantastic specimens ranging from a 1915 Ford Roadster to a 1990 AAR Eagle and almost everything else in between. I had the pleasure of attending the event with my fellow NorCal SCI co-founder, Franklin a C6 quad who uses a power chair, and Carl, NorCal SCI contributor, a T8 Para. Earl, another C6 quad who uses a Smart Drive on his manual chair and Ernest who had a C4 incomplete injury back in early 2015 were also there enjoying the hospitality. As I had been at the event before with wheelchair users, I knew that the parking, access and facilities would meet their needs and anything I did not anticipate, Franklin and Earl would be able to negotiate with their street smarts and wealth of travel experience. Not only was it great to see the multiple races from our vantage point but we all took the trip down to the paddock to get up close and personal with the fantastic vehicles themselves. It was fairly straightforward for Earl, Franklin and Carl to cross the access bridge and get down to the smooth and relatively flat paddock area where all the vehicles were located. I noticed a number of other wheelchair users viewing the vehicles and interacting with the mechanics and owners. In fact, one wheelchair user was assisted into one of the classic cars and was given a ride around the paddock. With their power devices, Earl and Franklin had no trouble returning to the booth on their own while I needed to give Carl some assistance to navigate his manual wheelchair up the short but relatively steep hill back to our viewing spot. We were offered, by the various event golf cart drivers, the opportunity of using their wheelchair-accessible carts to get around but we ended up not needing them though it was nice knowing they were there. Everyone was super helpful. The restrooms were very accessible and ADA standard. We really didn't see any obstacles and even if we did, event staff members were tripping over each other offering assistance. 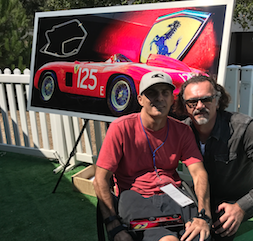 We were then invited to sign a stunning ~ 6-foot by 3 foot metallic image of the Ferrari Testarossa which won the inaugural race at Laguna Seca 60 years ago. GWP had commissioned this work from Mio Dzakula www.artofmio.com whom we all had the opportunity and pleasure to meet. This stunning work of art which employed a multi- layer sublimation on aluminum process will be donated to Rebekah's Family Services, an orphanage in Gilroy. We were each given a miniature replica personally signed by Mio. How cool was that! A special thanks to Brian King and Global Wealth Partners for hosting such a fantastic event and giving us the full VIP treatment.